Cascadia Capital, an investment bank serving middle market clients globally, today announced it acted as the exclusive financial advisor to OraHealth Corporation Inc. (“Orahealth”), a market leading provider of OTC all-natural oral care products that relieve specific oral health issues such as dry mouth, in its merger with Quest Products, a portfolio company of Promus Equity. 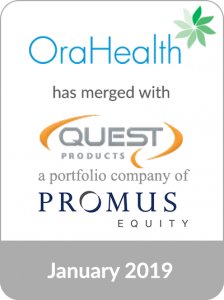 With this merger, Quest will add the OraCoat® brand of oral care products and its flagship product, XyliMelts® for Dry Mouth, to its portfolio of category leading brands, including Clinere, Alocane, and Provent. XyliMelts® employ patented technology backed by research and medical science to safely prevent dry mouth both during the day and while a user sleeps via all-natural, non-acidic oral-adhering discs that slowly release safe ingredients.